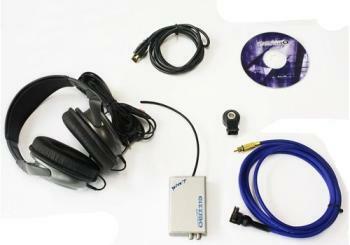 The Gizzmo KMon professional knock monitoring kit takes tuning to the next level. The KMon was designed with leading tuners for tuners with endless hours of dyno development as a major component in the research and development process. Each headphone can be independently configured with the included Gizzmo KMon software to listen to different knock sensors simultaneously; e.g. on a RB26DETT you could configure the left headphone to the front of the motor and the right headphone to the sensor on the rear of the motor or on the Z07 Corvette, one sensor could be used for the right bank and another for the left bank. There are two headphone jacks for the convenience of training a tuner or a second set of ears when tuning. The knock sensors used for the Gizzmo Kmon are the Bosch donut type that allow a 10mm threaded bolt through the center for easy mounting. The software allows you to tailor the knock channels individually to the motor in addition to setting up the headphones as you desire. It is also possible to set the headphones up so that they are silent until a warning threshold is reached e.g. you can set a warning level of 60% and if this threshold is exceeded the headphones will emit a loud, sharp buzz. After the software has been configured you can shut down the software and just plug in the Gizzmo Kmon (to a USB2 port) whenever you need it; the Gizzmo Kmon will always just return to your settings each time it is plugged in. The Kmon also has two analog outputs so that you can log the knock levels into a dyno or datalogging tables for comparisons against air fuel ratio, turbo boost etc. On the side of the Kmon are 4 LED’s; one indicates power, one flashes showing communications and 2 ultra bright LED’s illuminate if the knock threshold (previously explained) has been exceeded. Internally thing the Kmon is armed with 5 processors. 2 are 20mhz DSP processors (1 per knock channel), 2 are 48mhz RISC processors for number crunching, control and communications and the last processor assures accurate timing alignment.